On Thursday morning around 60 cyclists gathered at the northbound turning onto Vauxhall Bridge in London and began to lay their bicycles in an orderly line along the pavement. 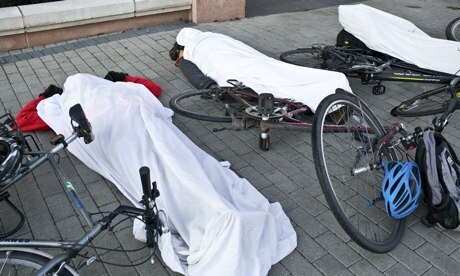 A new cyclists' die-in was underway. The protest had been organised by new direct action campaign group Stop Killing Cyclists, the group responsible for a 1,000-strong die-in outside Transport for London's offices at the end of November. A number of cyclists and pedestrians have been killed or seriously injured at or on roads leading to this junction in recent years. Pedalling from the west you can use a segregated cycle path. At this corner, however, cyclists are forced to turn back into the road just at the point where it becomes most dangerous. Activists have complained that, since the publicity about cyclist deaths back in November police officers engaged in the Met's "Operation Safeway" have been pouncing on errant cyclists who choose to take the safer route on the pavement this corner, serving them up with fixed penalty notices. "The introduction of the fixed penalty is not aimed at responsible cyclists who sometimes feel obliged to use the pavement out of fear of the traffic, and who show consideration to other pavement users. "Chief police officers, who are responsible for enforcement, acknowledge that many cyclists, particularly children and young people, are afraid to cycle on the road, sensitivity and careful use of police discretion is required." The campaign feels the junction is a good example of how poorly designed infrastructure creates hazards for cyclists and other road users. It also wishes to highlight how the recent police activity seems to be in contradiction to this ministerial guidance. As the protesters organised themselves a singer, accompanied by classical guitar, performed for passers by. This was followed by poignant laments played by two bagpipers. 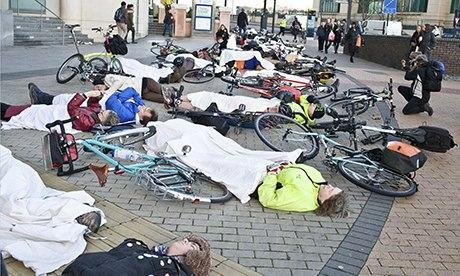 The assembled cyclists listened to some words from two of the organisers, Donnachadh McCarthy and Steve Routley and then proceeded to lay down on the pavement and cover themselves with sheets for the die-in. As the protest drew to a close a trumpeter the played the last post and the activists heard final speeches from, amongst others, Tom Kearney, a pedestrian victim of a serious bus accident that left him in a coma. Finally, Alison Higgs, another activist from the group, accused Boris Johnson of prioritising profit above cyclist and pedestrian safety. She also criticised Andrew Gilligan for dismissing the earlier protest of over 1,000 cyclists and speaking of a dialog with the deaf rather than dealing with the issue of funding. Since the protest the campaign has announced that it has a meeting scheduled with Leon Daniels, managing director of Transport for London, on 21 January to discuss its list of 15 demands. Boris Johnson's cycling commissioner, Andrew Gilligan, will also be in attendance. We await developments with interest. דעה: רוכבי האופניים חושבים שמותר להם הכל?